In the month of December 2017 alone, more than 3,000 satisfied customers submitted their inspirational transformation stories to the Beachbody Challenge, where healthy lifestyle changes are rewarded with prizes all year long. Taylor Oxendahl Lost 60 Pounds in 1 Year! A lot can change in a year. Just apply consistent effort to the right tools. For your convenience, we’ve combined a year of the best health and fitness tools into one package; we call it the Annual All-Access BOD Challenge Pack. 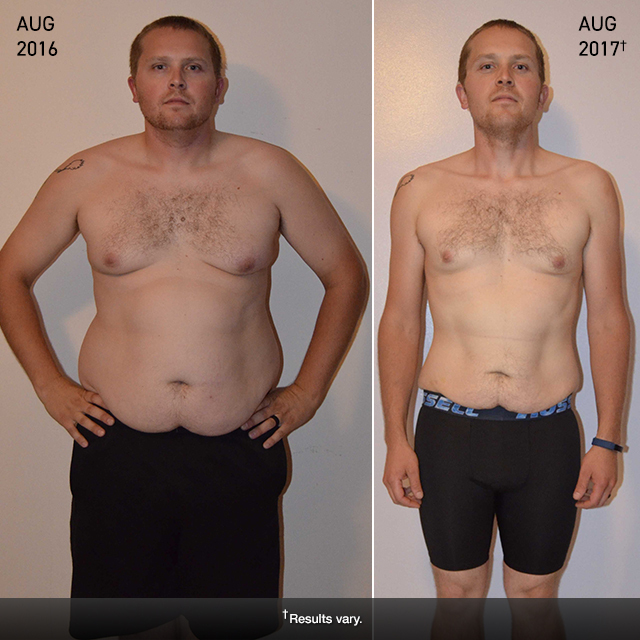 Taylor worked the system for a year, and behold his life-changing results! He says: “To be perfectly honest with you, it really wasn’t all that difficult to lose 60 pounds in a year, because Beachbody made it simple! This military veteran needed to be strong for his four kids after a messy divorce tore his family apart. By committing to daily exercise and good nutrition, David and his kids have made huge steps forward, together, and that puts a big smile on his face. He says: “I was a single father of four, recently divorced after 17 years of marriage. I have my kids full-time, so my life is very busy. One day the scale hit 240… two hundred and forty?! “I like the variety of the workouts, and I have to say I never got bored of them. I eventually took on other Beachbody workouts like 21 Day Fix and FOCUS T25. Fast forward 2.5 years, and holy cow! I’ve lost over 50 pounds, which amazes me, but it’s much more than just the weight loss. [My family and I] have a whole new outlook on what we can accomplish. I’m newly engaged, and my fiancée has lost 35 pounds herself! My confidence level has improved, and the biggest thing for me is knowing that I’m doing everything I can to stay happy and healthy for my four children. 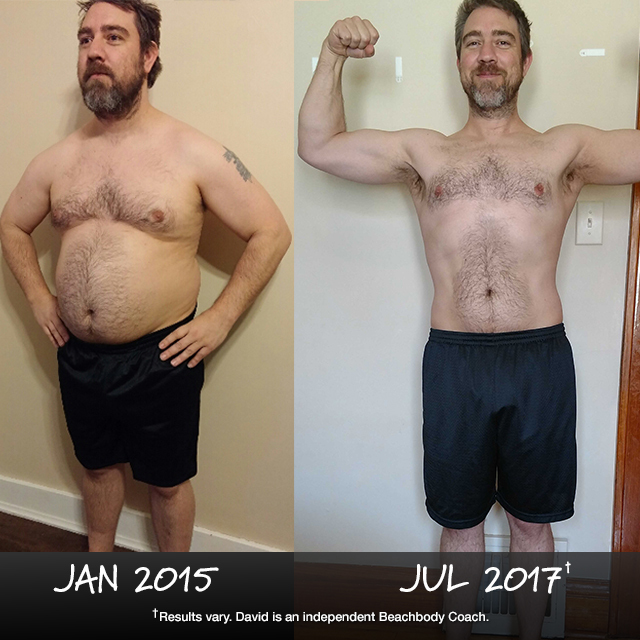 As a busy, traveling executive on the verge of developing type 2 diabetes, it was critical for Darren to find fitness programs that he could do anywhere around the world with little-to-no equipment. 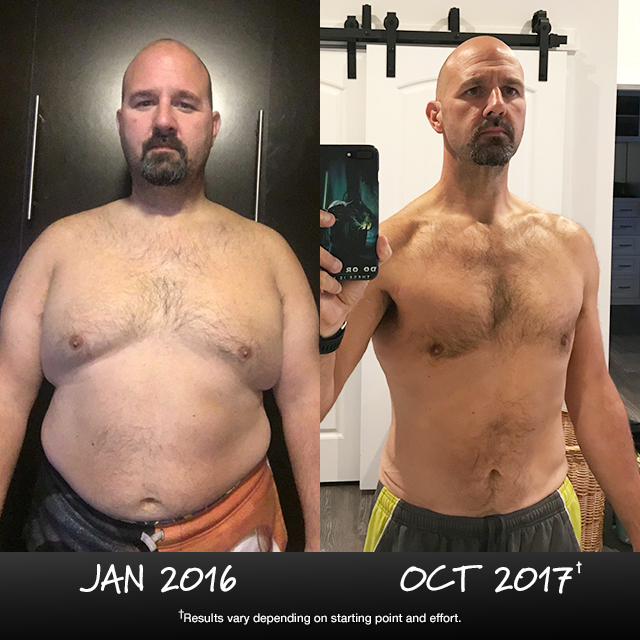 He got started with Slim in 6 on Beachbody On Demand, and he slowly worked his way up to more advanced workouts (like his personal favorite, CORE DE FORCE). Check out the results he achieved in less than two years! He says: “Beachbody On Demand was critical to my success. As a busy traveling executive, I use BOD in hotel rooms across the world. Having access to various workouts that require little or no equipment has been a real game-changer for me. The variety that BOD offers keeps me engaged and coming back for more every day. It has given me a new lease on life. I’ve gotten leaner and stronger than I’ve ever been. I weigh less than I did in high school! Beachbody programs are not designed to reunite you with estranged family members, but that’s what happened to 55-year-old Keith Sullivan after seeing his daughter Kailin’s inspirational transformation story on TV one night. He and Kailin hadn’t seen or spoken with each other in 12 years, but he was inspired by her story, and he summoned the courage to reach out to her for help with his own fitness transformation. 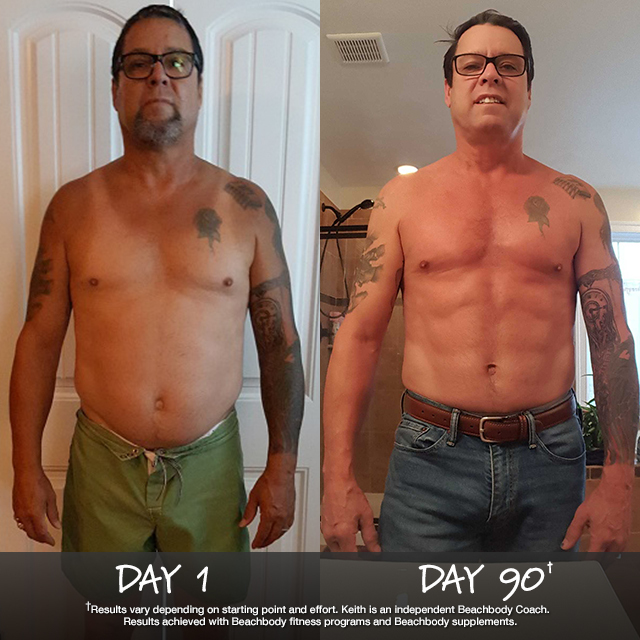 With Kailin as his Coach, he completed 90 days of Body Beast, got six-pack abs, and rekindled his relationship with his daughter. He says: “My size 36 pants were getting too tight, and I knew I wanted to lose some weight, but I was having a hard time getting started. One night, flipping through channels, I started watching a Body Beast infomercial, and I nearly fell out of my chair when I saw my daughter on the TV. She was featured in the infomercial and she looked great. I had not seen her in over 12 years. This kicked me into gear to lose weight, get physically fit again, and maybe create some common ground with my daughter to help us reconnect. I was told by a lot of people that I couldn’t get a six-pack in my 50s. They were wrong. After three months of the program, I lost over 40 pounds and had the six-pack I had in high school!